Joe & Maureen have over 60 years of combined experience in real estate appraisal, new home development and sales. They owned and managed their own appraisal firm and staff of appraisers for 15 years and have personally performed thousands of appraisals. Their clients included the FHA/VA, numerous Banks & Mortgage companies; and reviews for FNMA. Moving to Florida in 2000, both worked for two of the nation's largest homebuilders: WCI Communities and Town & Country Builders in permit acquisition and new home sales. 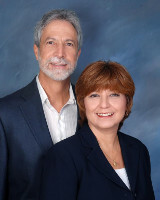 Relocating to Brevard County more than a decade ago, Joe and Maureen teamed up once again in real estate sales and have been multi-million dollar producers ever since. Drawing on their extensive background in appraisal, development and millions in sales, they are uniquely qualified to serve their clients with the confidence that results from a lifetime of knowledge and experience. Joe, a former US Coast Guard licensed captain well understands the particular needs of clients seeking waterfront (ocean & river) properties. Integrity, professionalism and service par excellence are paramount in the manner in which they conduct business. Maureen and husband Joe (US Marine Corps veteran) have been married and working together for over 30 years. They have two sons, highly successful in the marine industry in Fort Lauderdale, and are blessed with nine grandchildren. Whether buying or selling real estate, let us put our experience to work for you.